Eating My Way Through Wisconsin…Ribs, Bluegill, Sisig, and Hmong! As in a few previous trips, I have tried my best to experience more locally-unique places, as well as BBQs, during the lunch hours. Sometimes I wonder why only for lunches, after the 2 disastrous dinners I’ve had in Milwaukee so far. Looking back, the lunches were some of the most interesting foods of this trip, and each of them tells a story about Wisconsin. Again, I began by flying into Milwaukee. Before that terrible dinner at Braise, I had lunch at a little bar just west of the city called Double B’s BBQ & Burgers. A non-descript bar & grill with country music on and golf on the TV, it is known for some of the best BBQ in the Milwaukee area. I ordered some ribs to test it out. 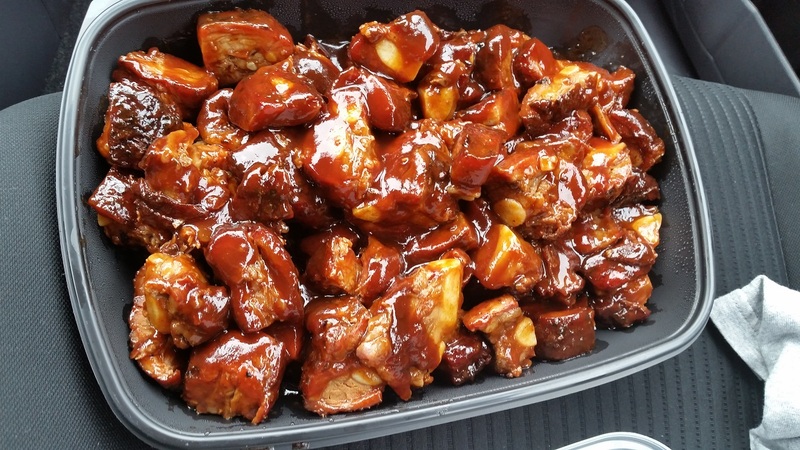 These are fabulous rib tips. I was planning on eating them while driving (yeah, I know…) but they were good enough (and also heavily sauced) I pulled over to enjoy them. Sauce brought out the meat well, and you know I rarely like heavy BBQ sauce. Good stuff, compared well with A&R in Memphis — though nowhere close to the amazing rib tips at Sim’s in Little Rock. But solid stuff, certainly ranks on top of the list in Wisconsin. I had my excellent dinner at A Pig in a Fur Coat that night and the next day was a busy one in Madison — despite the hangover. And it being Friday, I decided to follow the Wisconsin tradition of the Friday Fish Fry. With a huge Catholic population, this has become a celebrated event on Fridays all over the state, especially with good fish sources from all the lakes. I was in Madison, and the best place for it was Dexter’s Pub. 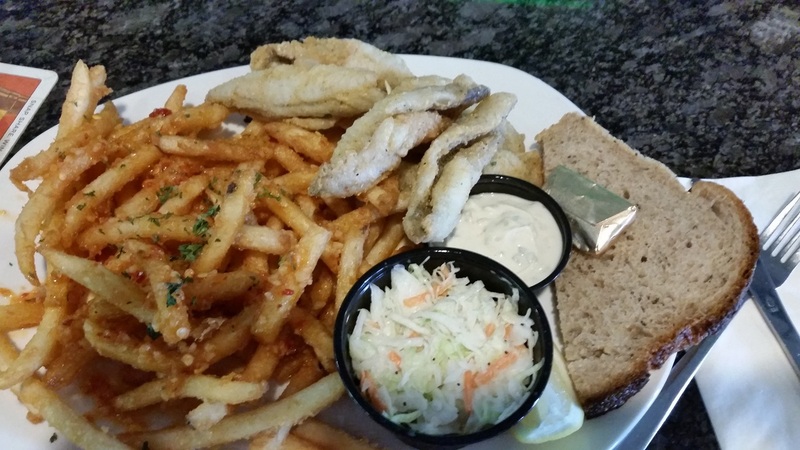 Ahhh… Bluegills are considered one of the delicacies for Wisconsin Friday Fish Fry sessions and they were excellent. Very little breading, fried just right, full of flavour. The portion wasn’t as small as it looked, it was the photo angle (sorry). There was actually ample fish. The fries were heavily garlicked too, so that was perfect. I drank more beer than I should (not due to alcohol but my recent digestive issues with beer…) and headed out very happy. Loving this particular Wisconsin tradition! And that night another wonderful dinner in Madison at Forequarter. I left Madison loving the town even more than I did the last time I left. It is such a little haven for wonderful cooking and friendly people that will bring me back. However, I had to head north for an event way north of the state, so I meandered up through the early morning and stopped for lunch in Oshkosh. Huh? Yeah, I stopped in Oshkosh this Saturday late morning and dropped into Manila Resto. Filipino food in central Wisconsin? Yep, and in a prime location too. I was very early so it was not busy this morning (plus there was a fair nearby). I had a hectic afternoon and long drives so wanted a solid lunch. And I got it, and more. The starter was the sisig (left), which honestly didn’t work that well for me. I wished it was more rustic with “proper” parts used, not just meat. It should have snouts and all sorts to make it real, to have texture. Plus, I usually don’t like the mayonnaise’d version compare to straight vinegary. But overall, for middle of Wisconsin, it was solid. Then the main, the pork adobo, was tempered a little but tasty. A good intro to Filipino cuisine for those who don’t have experience with it I suspect. There was also a sushi bar inside and they also do robata, so it’s a catch-all type in this small city, which is probably necessary. Charming owners too, who came by to have a chat. I headed north full and satisfied, with a box of sisig leftovers. Knowing I have to skip dinner due to the event later on, I had this leftover and needed more. For the next few hours I meandered north and in the mid/late afternoon arrived at the town of Wausau. I then dropped in to get some carry-out at a place called Hmong Eggrolls. 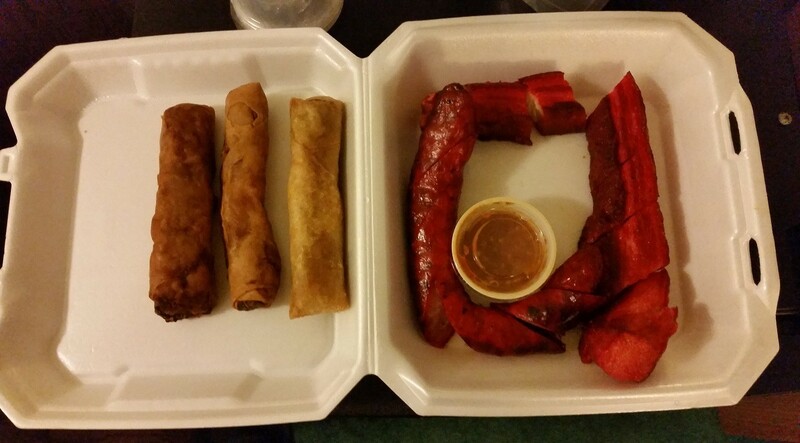 When I got to my destination I opened my food and this was there after I ate a few of the egg rolls. The prawn one was best, but all of them were excellent. Sorry for the terrible picture as it had gotten wee soggy from the long drive from restaurant to motel, it really doesn’t do it justice. And the sausage was just fantastic, and the roast pork belly? Fantastic and decadent. All roasted red. Fabulous. I should have taken the pix at the restaurant…you’d be drooling. I went to my outdoor event, got utterly frustrated by the organisation — and especially the people — and was eaten alive by mosquitos. I made my way back to the motel and finished the food happily, but the rest of the night was a trial thanks to idiots in adjacent rooms… Why are children jumping around at 2am? Where are the parents?! With not much sleep the next early morning I made my way back south via the eastern coast and got back to Milwaukee in early afternoon, where I dropped into the legendary Solly’s Grille for lunch. I got there early but it filled up very quickly and by the time I was done people were queueing for seats. 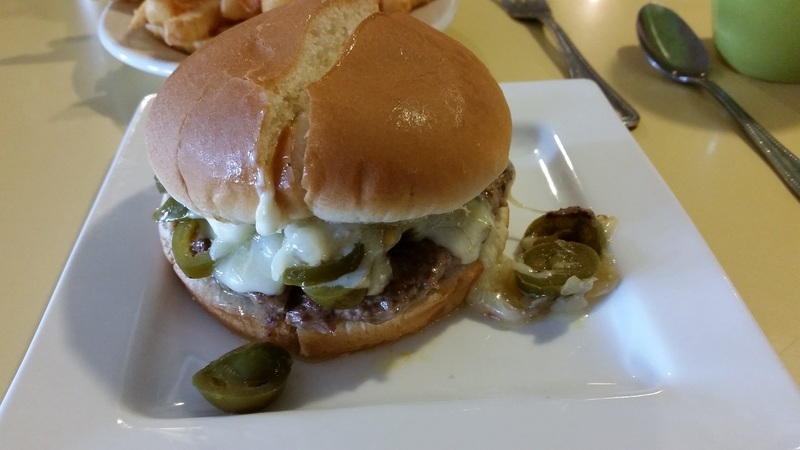 This old school diner is famous for its burgers, cooked with butter. It’s rich as hell, and I ordered the jalepeno version. Mmm, this is fabulous. Rich and solid, with a good bite from the japeleno. I can see why this is rated the best burger in Wisconsin. Service is very old school diner, with one sweet old lady working the counters at her pace. I left as quickly as possible to let all the hungry diners get a slot and I drove out. Later that night was the again-not-quite-right meal at Goodkind. Frankly that soured me so much the next day, my last day in Wisconsin, I chose to skip lunch. Originally planning ethnic — especially German — but I didn’t want volume for lunch. You’ll understand why when you see what I had for dinner — which is the next review. But truly, Wisconsin has a great variety of local flavours, some touched by older tradition like the Fish Fry, some coming from newer ethnic communities such as the large Hmong population. If you get a chance, explore this state, it is beautiful and interesting in so many ways. Just minimise your time in Milwaukee, maximise your time in Madison, and beware the mosquitos and other bugs of the forests! And eat, eat, eat your way through it! 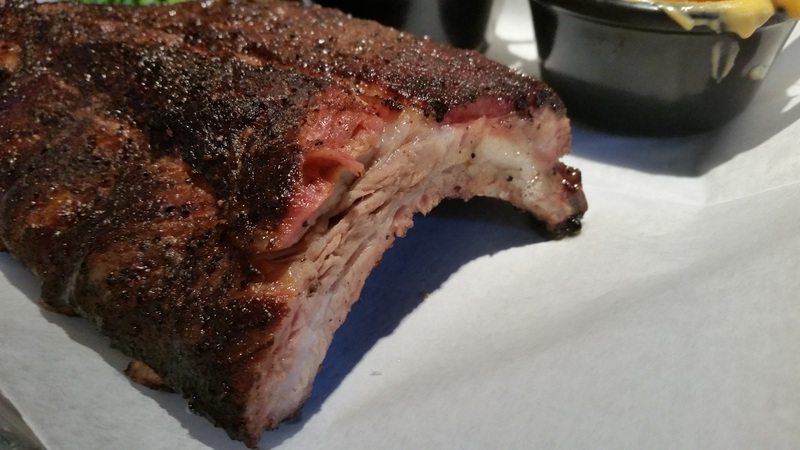 This entry was posted in Food..., Restaurant Review, Travel and tagged BBQ by mel91872. Bookmark the permalink. I love real sisig! Plenty of places do it authentically, even in the US, but middle of Wisconsin may be asking for too much. Plus Wisonsin, unlike let’s say Alaska, Filipinos do not dominate the Asian population; in WI it’s Hmong by far. You can get fabulous Sisig in California and New York, for instance. Of course nothing as good as having it in the Philippines, like I did last year!